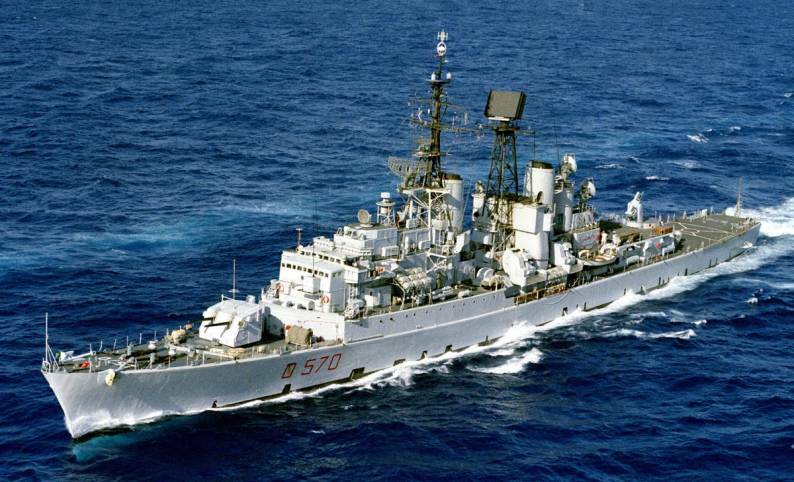 The Impavido class were the second group of destroyers built for the Italian Navy (Marina Militare Italiana / MMI) after World War II and the first Italian Guided Missile destroyers. Similar in performance to the American Charles F. Adams class, these ships were essentially improved Impetuoso class vessels, with the after gun-turret being replaced by a Mk-13 guided missile launching system (GMLS) for RIM-24 Tartar SAM and associated radar. Apart from the same main armament as that of the 'Adams', the emphasis of the weaponry was focused on anti-aircraft equipment, so the secondary armament was a battery of 76mm automatic guns fitted midships, not the ASROC missile. The 127mm guns remained. Torpedoes were the same as the wartime Mk 38, while the Adams had the newer Mk 42 which covered all the horizon thanks to their disposition, fore and aft. These ships were important because they represented the first missile destroyers in the MMI and lasted in service for many years, even if they had not had any important update (making them progressively obsolescent). A characteristic of these ships were the superstructures, having a much less clean layout than other classes, with a double line of windows in the main turrion, similar to the Alpino frigates.